Normal infection of liver cells by sporozoites. Normal development of liver stages up to 24 hours. Aberrant formation of liver-stage merozoites. No viable liver-stage merozoites are formed. No blood stage infection after infection of mice with mutant sporozoites. Reduced infectivity of sporozoites as shown by infection of mice by mosquito bite or injection of purified sporozoites (prolonged prepatent period and/or reduced number of mice developing blood infections) Pb apiG3PAT (-) and wild type sporozoites did not differ in their ability to invade hepatocytes. No difference in mean parasite size was observed between Pb apiG3PAT (-) and wild type parasites at 24 hours post-infection. However, at 48 and 66 hours post-infection, Pb apiG3PAT (-) parasites were significantly smaller than wild type (with mean areas 22 % and 26 % less than the control). Wild type parasites produced the majority of detached cells and merosomes at 66 hours post-infection, with smaller numbers of these forms detected at the 72 hours. By contrast, Pb apiG3PAT parasites were never seen to produce detached cells or merosomes at either 66 or 72 hours. Pb apiG3PAT (-) parasites had noticeably smaller apicoplasts and fewer nuclei than wild type at 48 and 66 hours. Normal MSP1 expression at 48h. At 66 hours, with MSP1 staining typically detected around individual merozoites in the wild type, but remaining patchy or indicative of only limited plasma membrane invagination in Pb apiG3PAT (-) parasites. Pf apiG3PAT (-) parasites have normal apicoplast morphology and development in the blood stage. A. Immunofluorescence microscopy of Pf apiG3PAT (-) and wild type parasites using antibodies against the apicoplast marker ACP demonstrates disruption of the enzyme has no effect apicoplast morphology in rings, trophozoites or schizonts. DNA stained with DAPI. Scale 3 μm. B. Transmission electron microscopy of trophozoite stage Pf apiG3PAT (-) and wild type parasites confirms disruption of the enzyme has no effect on apicoplast structure or membrane organization. Magnified images (inset) show the four apicoplast membranes are arranged in pairs (arrowheads) in both lines. Scale 100 nm.Shears MJ, MacRae JI, Mollard V, Goodman CD, Sturm A, Orchard LM, Llinás M, McConville MJ, Botté CY, McFadden GI. 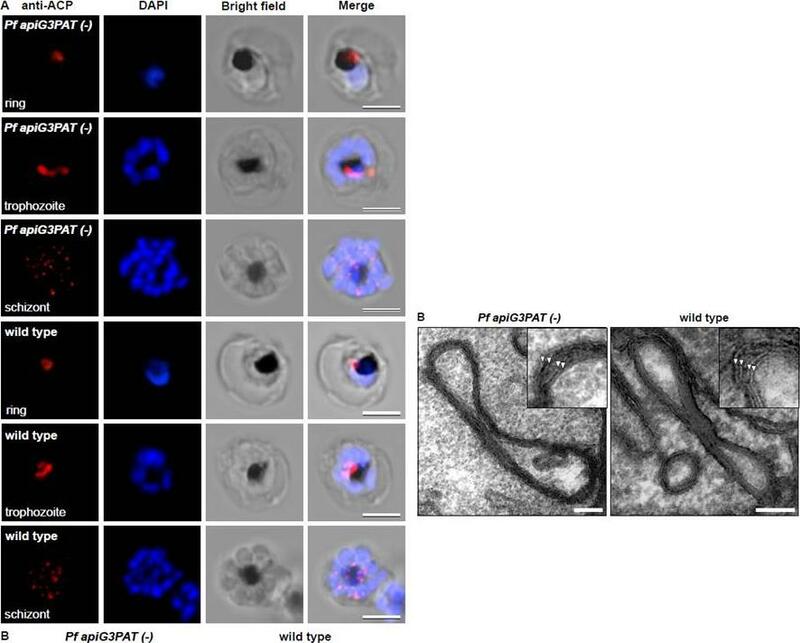 Characterization of the Plasmodium falciparum and P. berghei glycerol 3-phosphate acyltransferase involved in FASII fatty acid utilization in the malaria parasite apicoplast. Cell Microbiol. 2016Jun 20. PMID: 27324409.